There’s several reasons you might need to create a mail relay on your Windows server. The most common is that you might have network devices that wish to send emails that do not support the encryption and authentication protocols required by your email provider. Google Apps, for example, require that any device sending through the smtp.gmail.com server supports either SSL or TLS. Some older devices don’t, and it seems a little excessive to replace a multi-thousand-pound device for something so trivial. For sending to internal users on Google Mail it’s possible to simply use the aspmx.l.google.com MX server but this isn’t a terribly scalable solution and won’t work in a lot of cases. Delivery: This tab defines how the server sends messages onwards; this is where we’ll configure Google’s SMTP server and the authentication required for it. There’s 2 obvious ways to restrict who’s allowed to send email through this server. 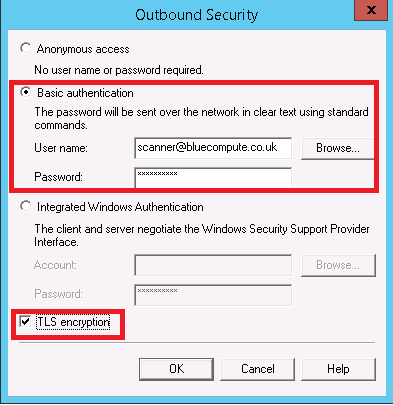 The first is by IP address – if we only allow access to the SMTP server from the IP address assigned to the scanner then no-one else should be able to use it (unless they specifically configure their device to use the address in question), or by user – we can create a user account for the scanner and configure it to authenticate against the SMTP Relay using basic authentication. I’m going to opt for the latter as it’s a more flexible solution; it will work for additional devices without reconfiguration, it allows me to use dynamic IPs for my scanners and and it’s not vulnerable to clients simply changing their IP address. While we’re here, click on “Relay” and check that the box labeled “Allow all computers which successfully authenticate to relay…” is ticked. This has configured the server to allow basic authentication for SMTP connections and to relay mail for any authenticated connection but hasn’t actually granted access to our user. This can be done on the Security tab – I imagine to have got this far you’re familiar with that process. On the “Delivery” tab, there’s 3 buttons at the bottom – we’ll need to configure settings in all 3 of these. 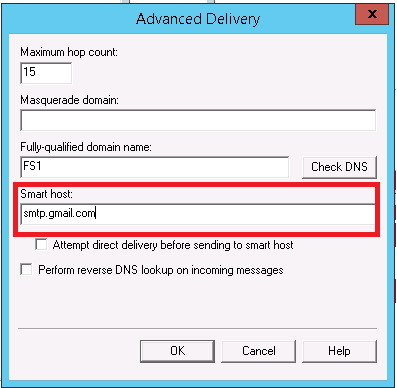 Here we’ll need to enter into the “Smart host” box the FQDN of the server we want to send through – in this example Google’s smtp.gmail.com server, but this could equally be and Office 365 or ISP-provided email server. 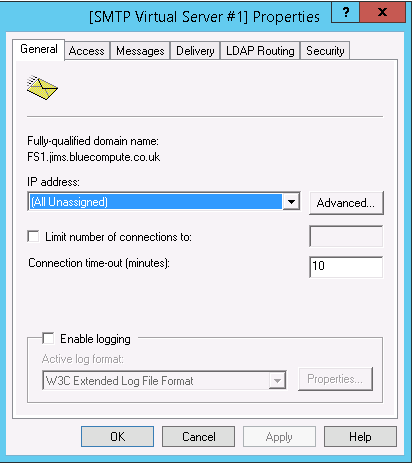 Leave everything else on it’s default settings (although for completeness you may wish to change the “Fully-qualified domain name” to match the reverse DNS entry for the IP address the connections will go out through), and make sure the “Attempt direct delivery….” box isn’t checked. 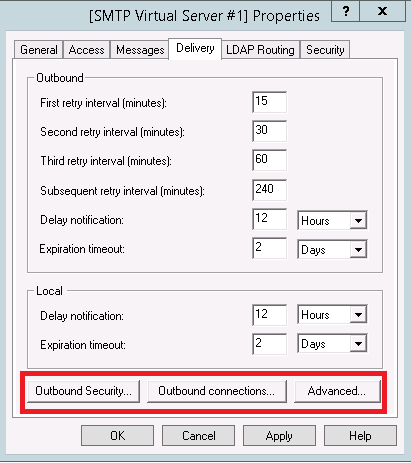 Next, the Outbound Security window. We’ll need to enter here details of an account that is authorized to send through the server configured on the “Advanced Delivery” page – I’d recommend setting up an account specifically for this purpose with your email provider. You’ll also need to tick the “TLS encryption” checkbox, or we’ll be trying to authenticate in-the-plain against the provider’s server putting us right back to square one! Forward the emails to the mail provider’s server for onward delivery. If you can’t get this working, please leave a comment below and we’ll see if we can get you working! Can I use one smtp server for different applications or do I need to create an smtp server for every application? You can use the same one for multiple applications. 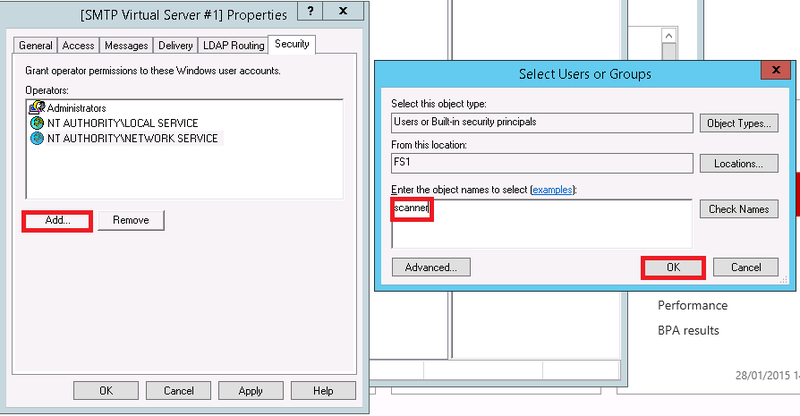 They can either share login details or you can create a Windows account for each sender. I’m using this for alerts that come out of my cctv box. If I’m using ip authentication what do I need to put in the Smtp server and port on my cctv box? 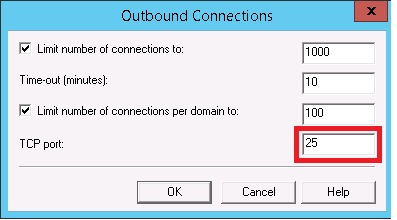 You’ll need to use port 25 and your server’s IP address. I am trying to move some managements to an isolated network and then dual homing a windows server as a relay server. Is there any special configurations I should consider? After a reboot the SMTP-server was down again. I had to start the SMTP-server manually again. 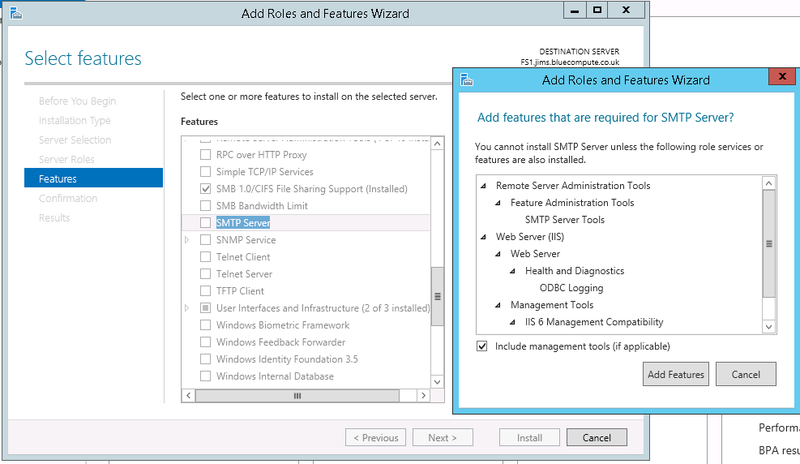 Is it possible to configure the SMTP-server on such a way that the SMTP-server starts automatically after a reboot?